There's trouble in the orange orchards and the farmer needs your help harvesting the oranges before the bugs ravage them. Click here to play! If you can help gather all of the oranges before the bugs do you'll be sitting pretty on a pile of cash! Spin the reels to gather baskets full of oranges. Three of them across the single pay line will get you the top prize of 1600 coins. Also helping you in your quest for Mocha Orange prizes are the lucky sevens. 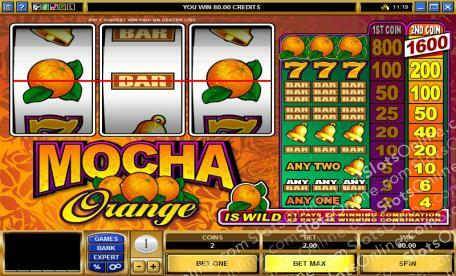 Spin three of these orange numbers across the pay line and take home up to 200 coins. There are also triple, double, and single BARS. Pluck three of either of these from the pay line and you'll get 100, 50, or 20 coins respectively. Also watch out for golden bells. Three of these valued symbols amongst the oranges will grab 40 coins. Plus, there are a couple of other combinations to spin for even more chances to bring in the wins. Be sure to wager the maximum of two coins in order to bring in the biggest wins. Can you help the farmer harvest his oranges before it's too late? Spin these reels and you could see yourself bringing in more than just baskets of oranges. The oranges act as a wild symbol and will replace all other symbols to help you create more wins. It will also double your prizes money if one appears in a winning combo and quadruple your prize if two appear in a winning combo.